A candle is an ignitable wick made of wax which provides light. Initially, candles were a functional product and only used as a source of light. In the modern world, candles are a symbol of celebration; it signifies aroma; defines a ceremony and events; soothes the senses etc. Manufacturers are innovating candles and offering aromatic candles for the living room, and dim light candles for the bedroom etc. Candles are available in various sizes, shapes, designs, and colors which includes tea lights, votive, pillars, birthday candles, cartridge candles, wax filled container candles, and others. Candles are manufactured from different kind of waxes such as beeswax, stearin, paraffin wax, rapeseed wax, palm wax, soy wax, and others. Paraffin wax is the most common raw material used in the production of candles. Candles made of organic wax are an alternative to paraffin wax candles. The global candle market is estimated to reach a value of US$13,619.3 Mn by 2026. Key factors driving the candle market includes increase in usage of candles for special occasions such as birthdays or marriage ceremonies, events, festivals etc. Furthermore, rise in usage of candles by therapists to create a peaceful ambiance in therapy rooms, lighting candles during prayers and for meditation etc. are some of the key factors fueling the growth of the candle market. Evolution in e-commerce has created huge opportunities for manufacturers and suppliers across the globe. In order to cater to a comprehensive range of customers across the world, manufacturers and suppliers of candles are focusing on selling their products on various e-commerce websites. 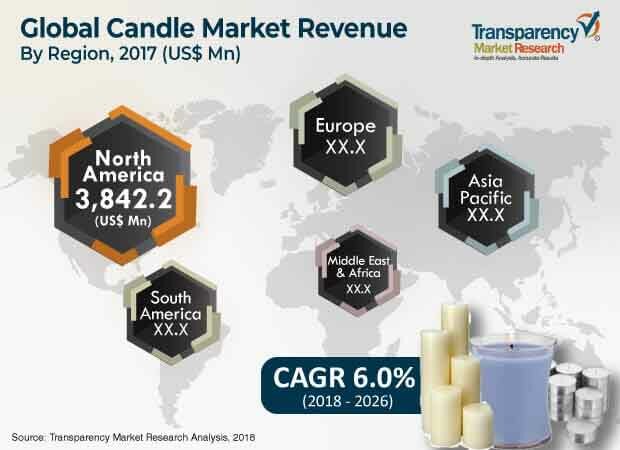 Rise in popularity of scented candles and wax filled container candles is expected to trigger the growth of the candle market during the forecast period. However, a major challenge restricting the growth of the candle market is volatility in the prices of raw materials. Availability of various substitute products such as electric candles, fairy lights etc. is anticipated to hamper the growth of the candle market. The usage of natural wax in the production of candles takes the product to a different level. The usage of natural wax is projected to continue to expand in the coming years. It includes products such as beeswax, soy based wax, and rapeseed wax. Consumers prefer a calm flame candle which leaves minimum wax. A candle which does not lead to carbon blackening in the home is preferred so that it does not have to be cleaned. Candle manufacturers are designing customized candles to cater to the different needs of customers. Scent infused candles are mostly preferred due to their added characteristic to lighten the mood. Aromatherapy treatment also employs scented candles which help to release mental and physical stress. The market for aromatherapy has grown rapidly, which has increased the consumption of aromatic candles. Manufacturers have also launched mosquito repellent candles which offer protection from mosquitoes. Citronella oil, a pure plant based derived oil is added to wax candles. Mosquito repellent candles are organic and give out a pleasant scent while burning and does not produce any toxic or harmful fumes. This is expected to augment the demand for candles from 2018 to 2026. Some of the prominent players operating in the global candle market include Vollmar GmbH, Baltic Candles Ltd, Bolsius International BV, Delsbo Candle AB, Duni AB, Hansa Candle AS, KORONA Candles S.A., Ceras Roura, Contract Candles Ltd, and Candle Scandinavia Group AB etc. These players are estimated to face tough competition in the near future due to presence of a large number of local players in the market. Major brands are likely to focus on innovation and research & development activities to strengthen their foothold in the global candle market. Companies are undertaking mergers and acquisitions, and joint ventures with local players to expand their product portfolio. Manufacturers in developing countries are focusing on reducing their cost of production and increase profitability for the sustainable growth of their business. This report on the global candle market provides analysis for the period 2016–2026, wherein 2017 is the base year and 2018 to 2026 is the forecast period. Data for 2016 has been included as historical information. The report covers market dynamics, including drivers, restraints, opportunities, trends, and policy and regulations, which are expected to influence the growth of the candle market during the said period. The study provides a comprehensive analysis of market growth throughout the forecast period in terms of value and volume estimates (US$ Mn and Thousand Tons) across different geographies. This report on the candle market categorized on the basis of type and raw material. New innovation in candles, new areas of application and rise in usage of candles for special occasions and ambience etc. are seen as a key drivers of the candle market across the globe. Increasing in consumption of eco-friendly candles, and rise in demand of candles for home decoration purpose will be going to create good opportunities in the candle market. Evolution in e-commerce has created huge opportunities for producers and distributors in the industry. In order to cater to a comprehensive range of customers across the world, producers and distributors of candles are focusing on selling their products on various e-commerce websites. Rise in popularity of scented candles and wax filled containers will trigger the growth of candle market during the forecast period. The candle market has been segmented on the basis of type, raw material, and region. Based on type, the market has been classified into tea lights, votive, pillars, birthday candle, cartridge candle, wax filled container and others. Based on raw material, the market has been categorized into beeswax, stearin, paraffin wax, rapeseed wax, palm wax, soy wax and others. On the basis of region, the report classifies the market into North America, Europe, Asia Pacific, Middle East & Africa, and South America. The regions are bifurcated in terms of value and volume of the candle market. Furthermore, prominent countries covered in the report include the U.S, Germany, Canada, France, the U.K., India, Japan, China, GCC, Brazil, and South Africa. The report highlights key developments of the candle market. Porter’s Five Force Analysis, which identifies bargaining power of suppliers, bargaining power of buyers, threat from new entrants, threat from substitutes, and degree of competition, is also included in the report. Value chain analysis that shows work flow in the candle market and identifies types and raw material providers of this industry. Segmental and regional trends have also been added in the report. It also covers country-wise analysis and segment-wise incremental opportunity analysis. The country-wise analysis shows a country’s economic information, which includes population, GDP, consumer spending per capita, disposable income per capita, and purchasing power parity. The report covers competition matrix of key players in the scope of study. Incremental opportunity analysis identifies and compares segment’s attractiveness on the basis of CAGR and market share index across North America, Europe, Asia Pacific, Middle East & Africa, and South America. The analysis has also been provided for each segment in terms of type and raw material. The report includes competition landscape, which covers competition matrix, market share analysis of major players in the global candle market based on their revenues, and profiles of prominent players. The competition matrix benchmarks leading players on the basis of their capabilities and potential to grow. Factors including market position, offerings, and R&D focus are attributed to a company’s capabilities. Factors such as topline growth, market share, segment growth, infrastructure facilities, and future outlook are attributed to a company’s potential to grow. This section also identifies and includes various recent developments and strategy of leading players in the candle market. Company profiling includes company overview, major business strategies, and key developments. Companies profiled in the global candle market include Vollmar GMBH, Baltic Candles Ltd, Bolsius International BV, Delsbo Candle AB, Duni AB, Hansa Candle AS, KORONA Candles S.A., Ceras Roura, Contract Candles Ltd, and Candle Scandinavia Group AB etc.